eople are living longer than ever before. The U.S. Centers for Disease Control and Prevention notes that an average 65-year-old in 2015 had a life expectancy of about 85. But there’s a problem with averages—they have nothing to do with how long any ONE individual will live. Average life expectancy is simply a mid-point suggesting half of the whole will live longer than that point and half will not. Averages aren’t indicators of the length of YOUR retirement. You need to plan to live well beyond your life expectancy, and there is only one way to ensure you’ll never outlive your money. Here’s how only a life insurance company can create the secret sauce needed to cook up an optimal retirement plan. There are three ingredients to guaranteed lifetime income. First is principal. Well anybody can give you principal. Second is interest; anybody can give you interest. But the third ingredient can’t be manufactured through stocks, bonds, real estate, or any financial institution other than an insurance company. It’s called mortality credits! Basically, they are a financial reward that increases the longer you live. Read my other post called “How to Get Paid for Living Longer: Mortality Credits” if you need a refresher, but any plan without them is suboptimal. It’s imperative that you transfer longevity risk to an insurance company. You see, the risk when companies sell life insurance is that someone dies too soon; the risk when they sell a lifetime income annuity is that someone lives too long. Because they are on both sides of the risk, they can hedge longevity risk. No other industry can do this! “But Tom, how can they afford to do this?” There’s more to the secret sauce. Just like how life expectancies are averages, a life insurance company doesn’t know when YOU are going to die, but they know almost exactly how long 100 people just LIKE you will live as a group. Some of you are probably thinking, “What if I die too soon? Won’t I miss out on these mortality credits?” This is why I would never say put ALL your money into an annuity. I say you need to cover basic expenses in retirement using guaranteed lifetime income. Life insurance is what covers you in case you die too soon, and it’s the longevity credits of guaranteed lifetime income that ensures you never outlive your money. You need to plan to age 75, 85, 95, and beyond because average life expectancies are just averages! An optimal retirement plan is diverse. It includes life insurance to cover one risk and guaranteed lifetime income to hedge the other side of the risk. 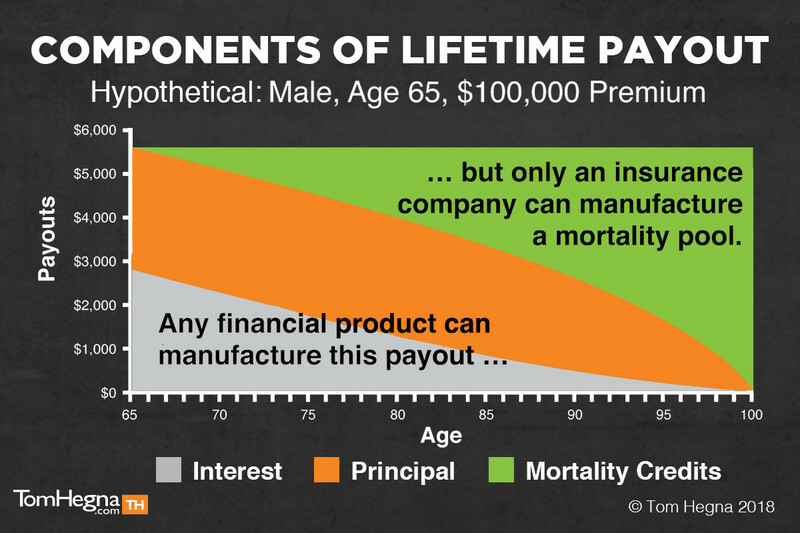 Through mortality credits, an annuity can provide more income for you than ANY other product out there! Bonds can't do it; CDs can't do it; investments can't do it; YOU can't do it alone. Only an insurance company can manufacture the secret sauce needed to secure your retirement for life.